Officially, Spring is just weeks away but I guess the Weather Gods aren't aware of that. There is nothing remotely "green" around. Its still cold, grey and barren. Frankly, I'm tired of this cold and snow and I hate grabbing those bulky jackets, scarves and ear muffs on my way out. I would give anything... just anything to see a speck of green around me right now! Last Sunday, though it was still snowing outside, my heart jumped with joy at the sight of fresh Mint bundles in my farmers market. Tender asparagus, baby Brussels Sprouts, fresh herbs... all fresh, green and vibrant. Spring couldn't be far away, I thought as I helped myself to a large bundles of Mint, Dill and Cilantro. Herbs are my weakness. I just don't seem to have enough of them. Mint always reminds me of Summer when Ma would make her famous Aam-Pudina bata (a condiment made with raw mangoes and mint leaves), which we relished with patla Musurir dal (a runny lentil/masoor soup) and aloo bhaja (potato fries). It was also stirred in water along with roasted cumin seeds and rock salt and given to us before we stepped outside into the harsh summer sun. The pea and the mint soup was in my mind ever since I saw it on Bhavna's blog about a year ago. The idea of sweet sweet pea paired with the refreshing freshness of mint leaves sounded very alluring and very summery. Her recipe, however, is very different from mine. Her's, an elaborate affair and mine the shortest cut possible. 1. In a saucepan, combine peas, stock, green onion, ginger, garlic and salt and bring to a boil. Simmer till the peas are very very tender. 10 mins for fresh and 5-6 mins for frozen peas. 2. Let it cool slightly. Discard the green onions and the ginger pieces. 3. 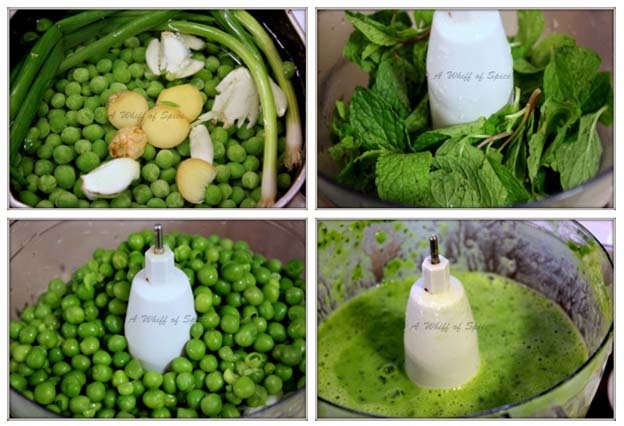 In a blender, put the mint leaves, boiled peas with the liquid and blend till smooth. 4. Add the yogurt, salt and pepper and blend till smooth and thick. Check the seasoning and adjust accordingly. 5. Pour in serving bowl and serve immediately. Alternatively, the soup can be chilled and serve cold too. 6. Serve with bread sticks, croutons or crackers. This soup is not completely guilt-free. Though sweet peas are very low in Saturated Fat and Cholesterol and are also a good source of Protein, Vitamin A, Riboflavin, Niacin, Vitamin B6, Folate, Magnesium, Phosphorus and Copper and a very good source of Dietary Fiber, Vitamin C, Vitamin K, Thiamin and Manganese, they are also high on Carbohydrates and Sugar. This soup with a serving of a grilled fish or chicken should be a good dinner option.